Today, I am proud to be a guest on the website, My Botanical Garden. I hope that my explorations in knowing the land by walking it daily, camera in hand, will bring the garden’s readers at least some of the delight it has brought me for the past 18 months. Today, I’d like to share a way of looking at gardens: not in space, or in the balance of species with each other, but in time. After all, as creatures of the earth, I think we all live there. I think it’s time we all moved back to the Earth. Gardens live in time. Let’s start with that. It snowed last night. Don’t worry. Here in the dry grasslands in the troughs of a volcanic plateau east of the uplifted volcanoes of the Northeast Pacific Coast, it is not winter. It is late spring — not late spring 2013, but the late spring of the earth. 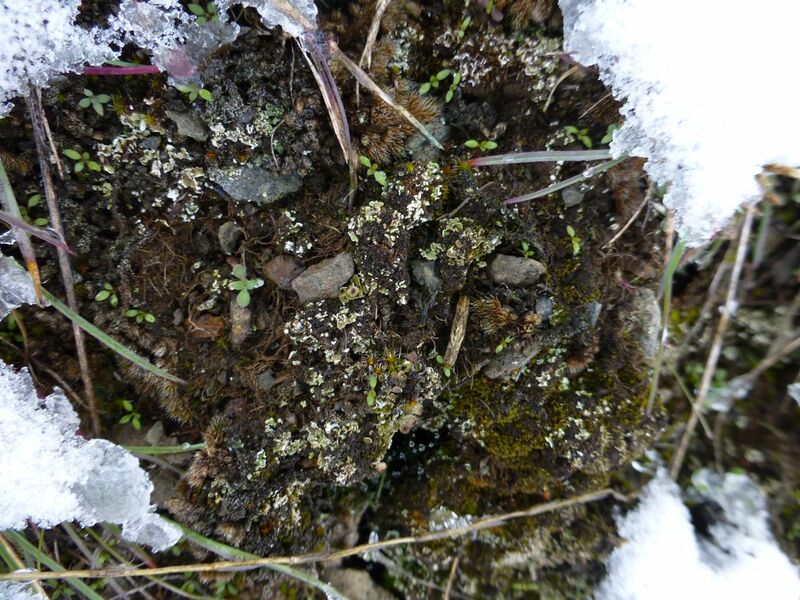 Lichens survive well in extreme climates, such as the Arctic (and the arctic conditions of a valley winter). These complex symbiotic organisms are ancient combinations of algae and fungus that were among the first creatures to move from the ocean to dry land. The date is controversial, but conservative estimates put it at 675 million years ago. The snow here is not acting as a cooling agent but as a greenhouse, providing essential moisture, letting through light, and concentrating heat. This photograph was taken 8 days ago. In greenhouses of this kind, it’s always helpful to have a rock, to hold that heat just a little bit longer. 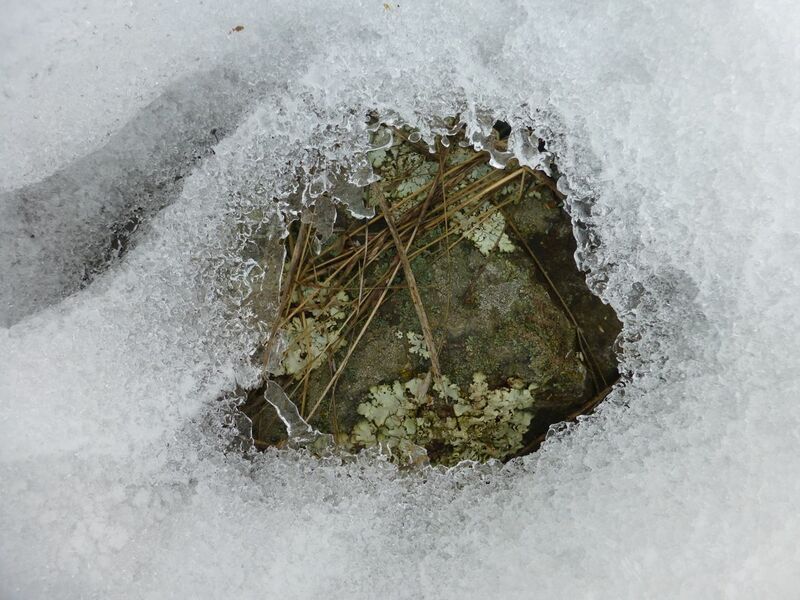 Eventually, the rock melts through the snow and opens the lichen to the sun — just as the earth does, might I point out, in space. Now it is deep summer. The world is abloom. The rock is about 50 million years old. The lichens? 675 million. The cyanobacteria that joined with the fungus to create them? Perhaps 3500 million. The photograph? 4 days. And that’s just the thing. 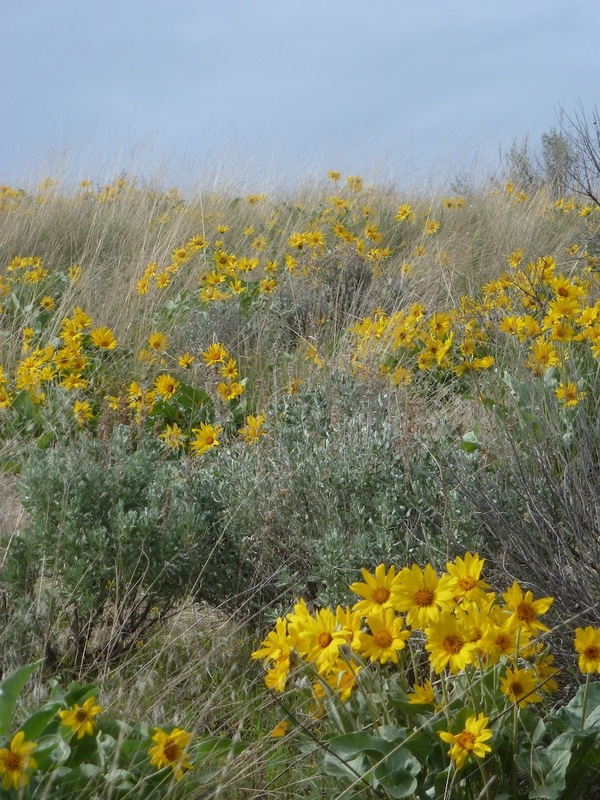 This botanical garden blooms not only in the North Okanagan Grasslands, which is one current name for this chain of volcanic islands that floated across the Pacific sea floor from Japan long ago, but blooms in time as well. Each year, the entire history of life on earth is repeated here. Long before conventional wisdom imported from Europe 150 years ago declares winter to be over and spring to be coming into sight, it will be Autumn here, and soon after that, Winter. First, though, let’s just enjoy the sweet days of Summer. After all, the lichens are beautifully diverse. Everywhere you look, the volcanic breccia is covered in a profusion of blooms, much like an alpine meadow, or a tide pool. 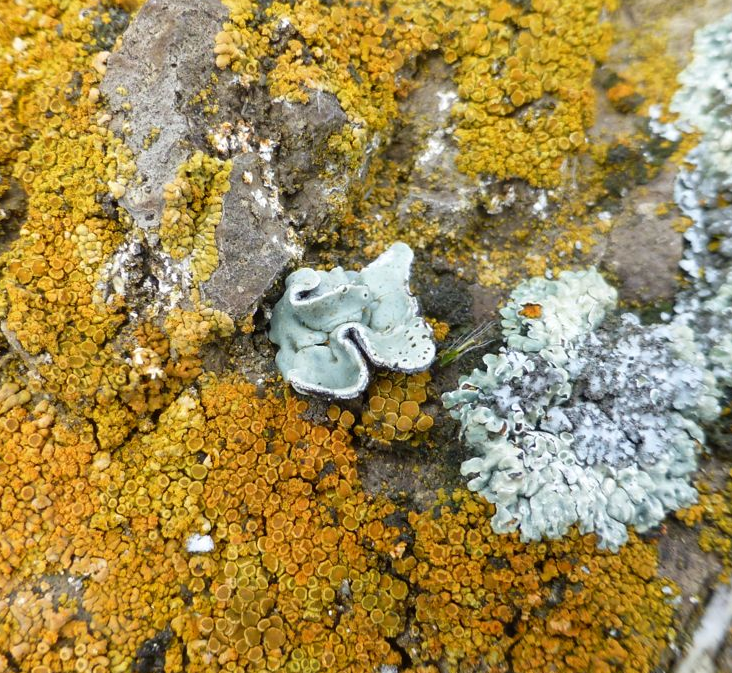 Lichens have been shown to be capable of surviving unprotected in space. They won’t exactly thrive there, though. They draw their nutrients from the atmosphere and are sheltered by it from ultraviolet rays. Still, they aren’t so much land plants as atmospheric ones. They live and feed in the sky. Mind you, they do tether themselves to rocks, for the heat and stability they provide. Even that is tricky, though, on a planet that just won’t stay in one form for as long as they do. These rocks, melted and lifted into the air by the superheating of the embedded water in ancient seabeds driven under the continent, are now breaking apart like waves crashing on a beach. This surf moves the lichens around. The 50 million years involved are nothing to the lichens. You want age on this beach landscape? Don’t look to the rocks for it. Creatures like humans live by using the oxygen in the air to break down food — oxygen created by early cyanobacteria (and lichens). 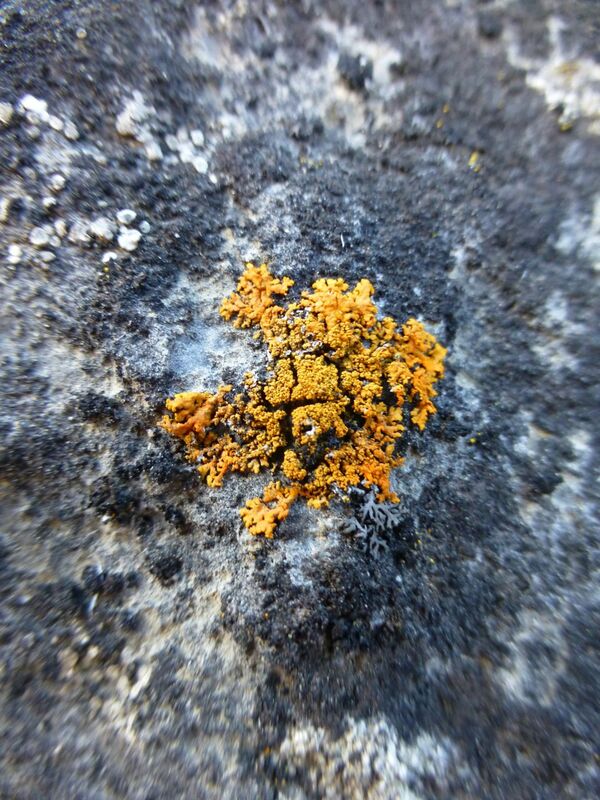 Lichens, on the other hand, just draw their nutrients from the gasses of the atmosphere itself. 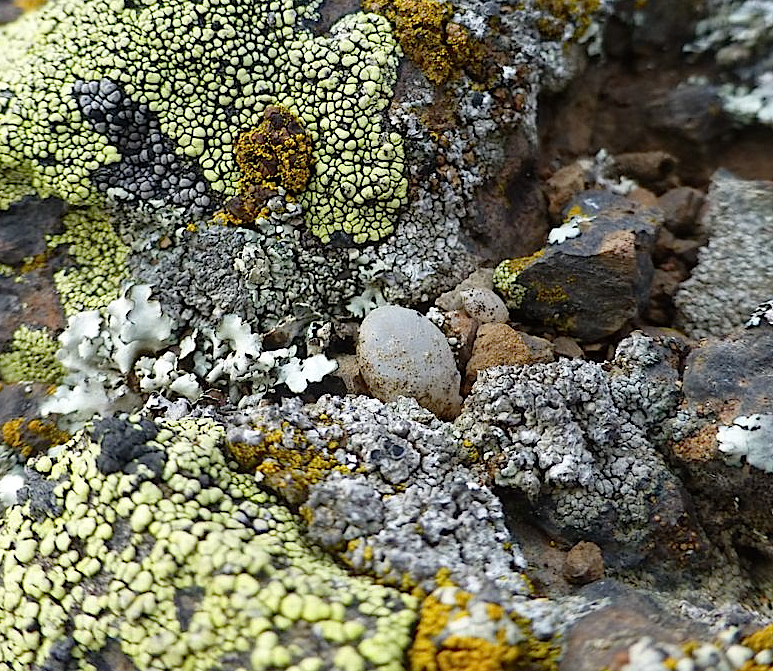 In the deeps of space (where lichens live…on earth), it is no accident that they are anchored to a rock (the earth) large enough to hold gasses to its surface. They form an interface between that rock and its atmosphere. They are the rocks, breathing — the porous tissues performing gas exchanges at the depths of the earth’s lungs. 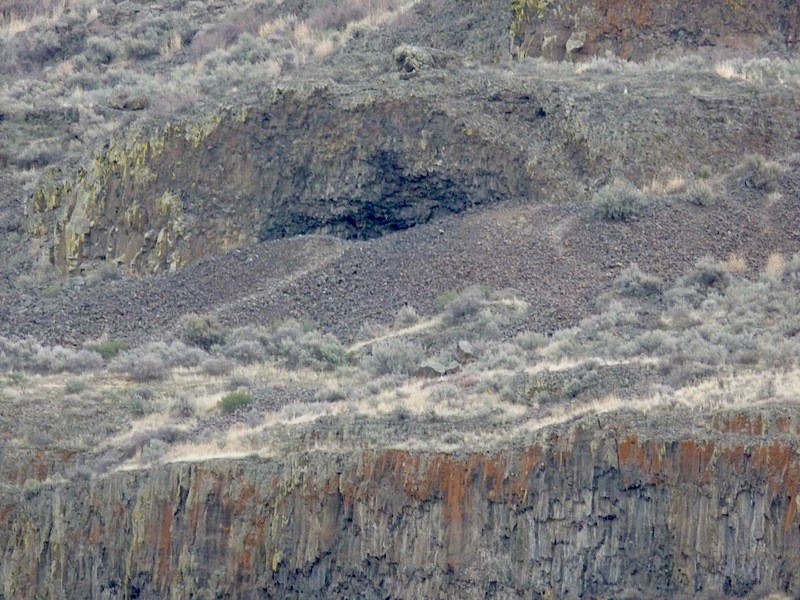 In the case of this rock, the surf is driven by the orbit of the earth around its star: water melts, pours down cracks in the basalt, freezes, expands, and breaks it apart, year by year by year. Here, the newest rocks are like the earth was when the first lichen attached itself to it 675 million years ago. With a healthy lichen crust, the rock to left and right is more mature. When the rocks break, the lichens attached to them are spread across the land by the combined forces of the sun’s gravity, the earth’s gravity, and water. Out there, they form tiny, independent colonies of ancient earth in the far newer, more sophisticated grasses. The lichen on the piece of breccia at the bases of these grasses is surrounded by other lichens, that have anchored themselves to tiny bits of rubble, and yet others, that form a crust on the soil, in which grassland seeds lodge and then sprout. Many grassland seeds will not sprout without this matrix. For all these lichens, it is early Autumn now. Winter, the hot dry season that Europeans call summer, is not far away. Then, all these lichens will soon be as crisp as burnt paper. If you would be so foolish as to walk on them, the sound of their bones breaking would crunch under your feet. 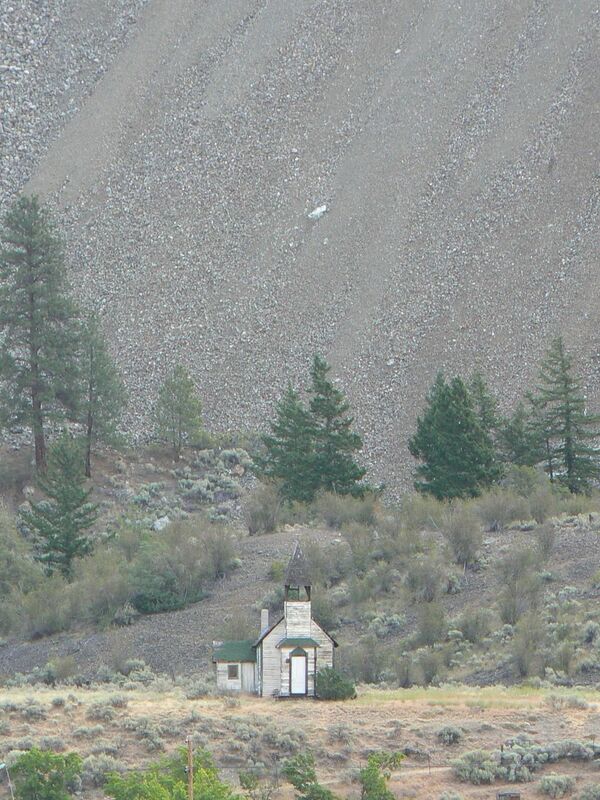 Note the dry yellow lichens spilling down the rock at this ancient human habitation at the heart of the grasslands. 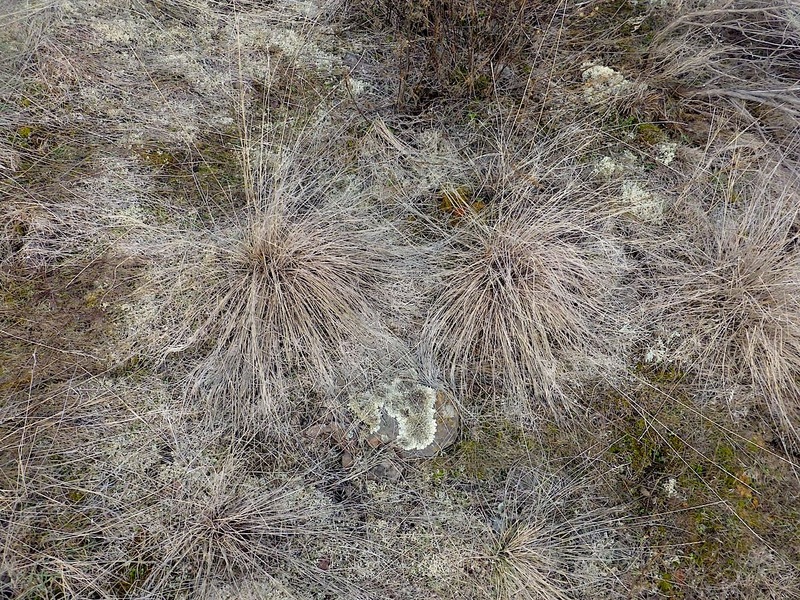 Once a rich habitat with its own species of rhinoceros, this shrub steppe rarely gets rain now, yet what rain it gets is often caught by the lichens before it strikes the ground. The old ones first, I guess. Well, it is their planet. They made all of us. 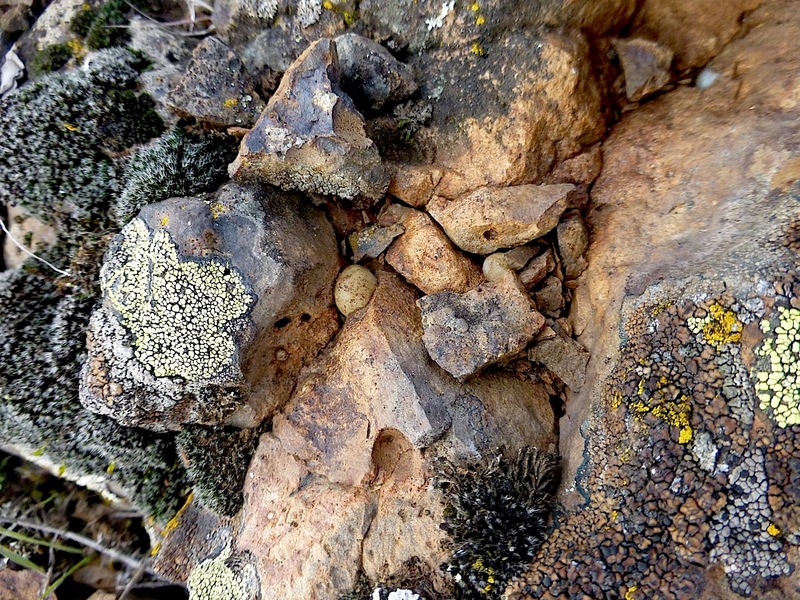 When lichens form a complex crust on the surface of the soil between the widely spread plants of the grasslands, they anchor the soil and form a living, breathing interface between the oxygen rich atmosphere underground and the carbon dioxide rich one above — at least as plants experience it. Because it is in this crust that the plants of the grassland root, it is no exaggeration to say that all of the intense diversity and evolutionary splendour of this habitat, from the first grasses to flowering plants, butterflies and green sweat bees, are still dependent upon the lichens in which the first grasses and flowers rooted. The crust is broken into tiny grooves and channels and tiny microcosms, with their own weather (it is often ten degrees warmer there than it is just inches above.) It is the perfect place to nurse seeds into life, in a story that replicates the history of the grasses as well as that of the lichens. The folds of the land are similar to the folds of leaf proteins, that capture hydrogen atoms, then hold them at exactly the right angles to ensure that the correct chemical reactions occur for photosynthesis. 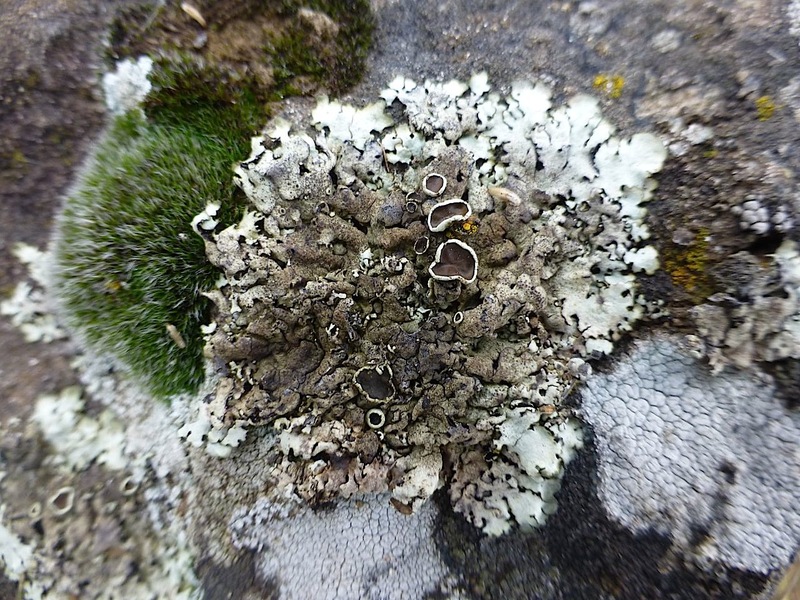 I suspect that the cupped shape of the lichens is repeating the same pattern. Typically, these lichens pass on water from one individual to another, down an incline, just as the water is passed on to them by the great pumping system of the earth’s orbit around the sun. They are like photographs of gravity. Still to come are the grass, shrubs, and the flowers, rooted less in the soil than in communities of lichen and bacteria. 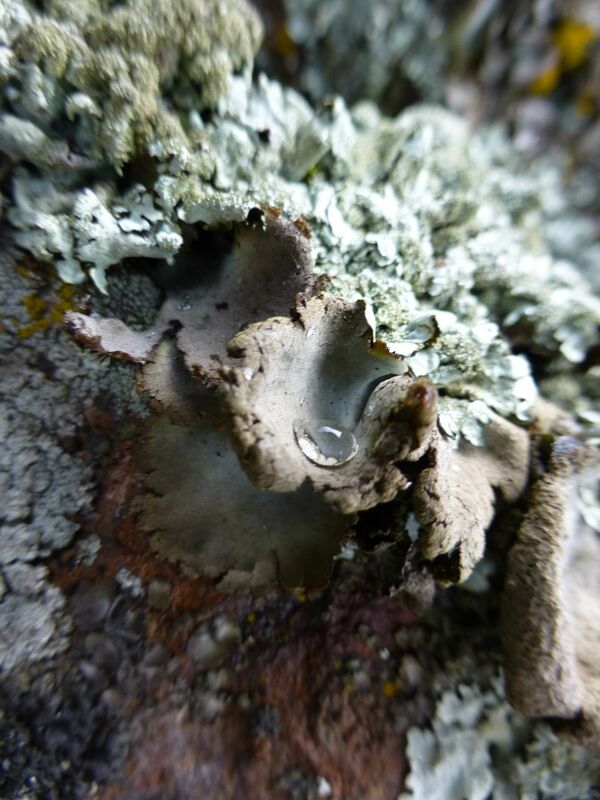 On the foundation of atmosphere and soil crusts provided by lichen, they evolved to withstand the consequences of the lichens’ success: a new, poisonous atmosphere and the new, deep droughts of the lichen’s winter. 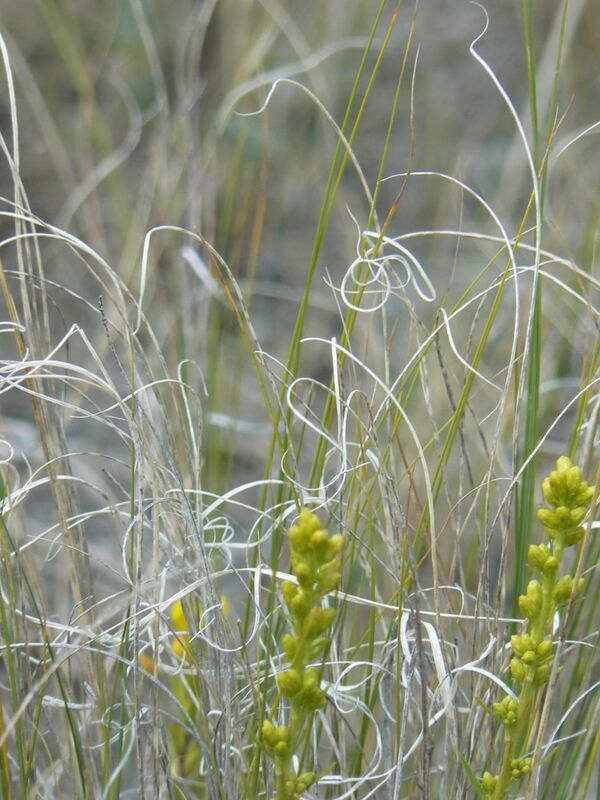 Curls of last season’s Blue-Bunched Wheatgrass in The Junction Sheep Range, at the confluence of the Chilcotin and Fraser Rivers. This is the last pristine temperate grassland on earth. By the time the flowers come, those even later developers on ancient earth, the story of the lichen will be long over for the year, but right now its beauty is at its peak. Month by month now the earth is going to move through all the stages of its evolution as a living planet, until it comes again to cold and stillness, as it will again when the sun is old and puts out little light. It repeats the journey every year. Its gardens don’t exist in space. They exist in time. I can’t tear my eyes away. I am thrilled to announce Harold Rhenisch is My Botanical Garden’s new contributing writer.Thank you ,Harold , for this excursion into time and essence of our earth.I am sure My Botanical Garden readers will love to come back to Okanagan Okanagan, to have a walk across this ancient land full of memories. A winning union in the making. Congratulations.